News Article - Learning Network Goes Live! Hagerstown, MD – April 13, 2012 – ResponderSafety.Com from the Emergency Responder Safety Institute (ERSI) is now releasing free training modules on The Responder Safety Learning Network. The network is accessible directly from www.respondersafety.com and it will soon be mobile ready for tablets and smartphones. 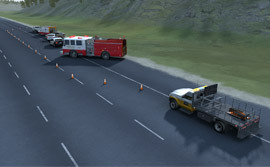 The addition of The Responder Safety Learning Network to the established ResponderSafety.com has created the single largest online hub for roadway emergency responder training and resources. The Responder Safety Learning Network, created with a Fire Prevention & Safety Grant from the United States Fire Administration (USFA), is a model of interagency cooperation and public-private partnership to provide vital, expert-vetted safety education that will save responder and civilian lives. Stephen P. Austin, project manager, notes, “This Network is the culmination of over 13 years of hard work by ERSI to educate highway incident responders about the dangers of working in moving traffic and the negative impact traffic congestion has on secondary accident frequency, commerce, and the American way of life.” The Network has garnered enthusiastic support from valued partners, including the USFA, Department of Justice, and the Federal Highway Administration. The National Fallen Firefighters Foundation and the International Association of Fire Chiefs’ Near Miss Program have also provided extensive assistance. Once registered, users can access free modules with video, interactive knowledge checks, user progress tracking, and completion certificates for those in pursuit of professional development goals. "This outstanding, no cost program, will provide firefighters, officers, chiefs, and other responders with the training tools necessary for our own survival while operating on roadways and highways" says Deputy Fire Chief Billy Goldfeder, EFO. The Network’s learning modules are developed and vetted by interdisciplinary groups of experts from all roadway responder groups — fire, police, EMS, DOT, and towing and recovery — at the federal, state, local, private sector, nonprofit, and association levels. The development of the Network is the National Unified Goal in action: creating and delivering, often for the first time, training that takes into account the perspectives, needs, and procedures of all responder groups. Even prior to the launch, the response to the Network has been overwhelming. Federal agencies, NGOs, professional associations, state agencies, local fire departments, and private companies have all reached out to offer content expertise, financial assistance, networking, and publicity contacts. The Network has already been embraced by multiple states as a way to support their own training needs. The Fire Department Safety Officer’s Association will grant CEUs earned by completing the modules toward Pro Board accredited safety officer’s programs.